Page 7, Newsletters from RHQ are usually on site as soon as I receive them. PAGE 9, COMBAT STRESS HELPLINE. 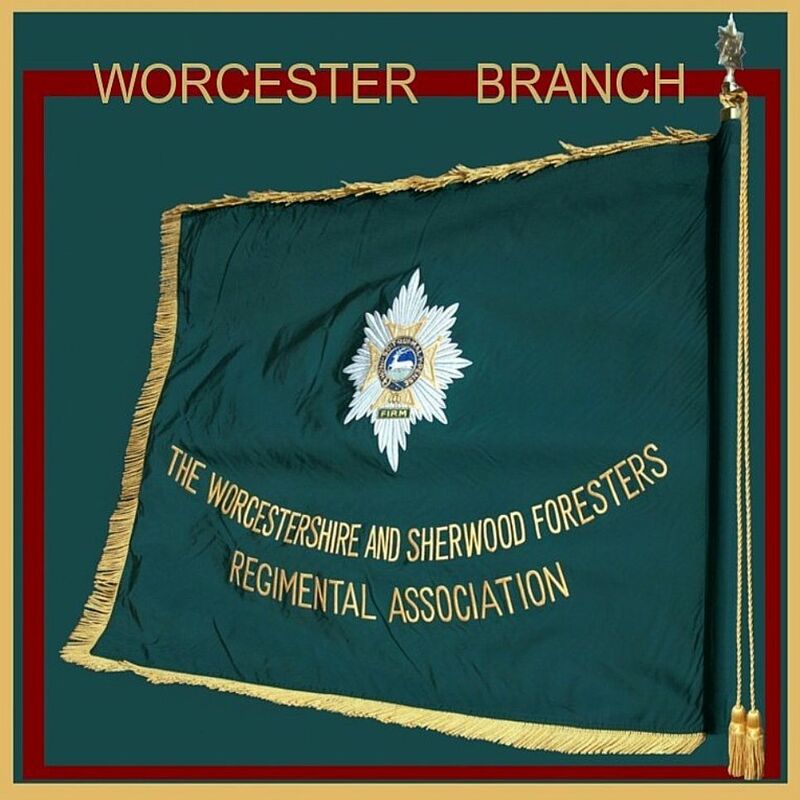 WORCESTERSHIRE REGIMENT AND WORCESTERSHIRE AND SHERWOOD FORESTERS (WFR) REGIMENT ONLY. NEWS!! ORTHOPAEDIC SURGERY PAGE 6 'NEWS ANNOUNCEMENTS' POSTED 27TH MAY 2017 & 18TH JULY 2017. PAGES 7 & 12, NEWSLETTERS 1 & OBITUARIES. WO1 (former secretary Worcester Branch) Maurice 'Mo' Smith . PAGE 5, DATES FOR MEETINGS/EVENTS. DATES FOR DIARIES AND 27TH APRIL WFR BENCH UNVEILING GHELUVELT PARK WORCESTER. I am looking for people who knew my grandfather Thomas John Pomeroy . PAGES 7 & 12, NEWSLETTER 1 & OBITUARIES. 14491287 PTE FRANK LEONARDI. PAGES 7 & 12, NEWSLETTER 1 & OBITUARIES. 311456 CAPT. PETER REX LANGHAM MC. PAGE 7 & 12. NEWSLETTER 1 & OBITUARIES. RIDLEY Vivian Howard MBE QGM: 426990 Lt Col. PAGE 7 & 12, NEWSLETTER 1 & OBITUARIES. 14577577 Sgt T. C. Dutton. PAGES 7 & 12, NEWSLETTER 1 & OBITUARIES. Mrs Mary Clare HINCE (11TH JAN 2019). PAGES 7 & 12, NEWSLETTERS 1 & OBITUARIES. 23766628 Pte Kenneth WILKINSON . PAGE 2, WELCOME. CHRISTMAS MESSAGE. PAGES 7 & 12, NEWSLETTERS 1 & OBITUARIES. In-pensioner 21012363 WOI Charles Edward SHRIMPTON of Royal Hospital Chelsea . 23946789 LCPL ERIC 'DANNY' SHOOTER. 24134213 PTE TRENCE 'TERRY' PLATTS. 23708382 CSGT FREDERICK 'TANKY 82' TAYLOR. PAGE 5, DATES FOR MEETINGS / EVENTS / PARADES. 2019 DATES FOR BRANCH AND COMMITTEE MEETINGS. PAGE 7 NEWSLETTER 1. ASSOCIATION NEWSLETTER. PAGES 7 & 12, NEWSLETTER 1 & OBITUARIES, 22072310 PTE TERENCE ‘TANK ’ TAYLOR . PAGES 7 & 12, NEWSLETTERS 1 & OBITUARIES. 24553398 PTE GLEN "ROSIE" T ROSE. 484882 MAJ ANDREW HENRY HOPKINS. 4979024 LCPL WILLIAM FRANK MELLOR. 23791698 PTE PETER JOHN(JACK) PICKARD. PAGE 5, DATES FOR MEETINGS / EVENTS. DETAILS OF BELOW ON THIS PAGE. SUN 23RD SEPT. NMA FEW PLACES LEFT ON COACH. FRI 28TH SEPT. FILM ST HELENS CHURH FILMSHOW WOMEN WW1. SAT 13TH OCT. WFRA AGM. SAT - SUN, 20-21ST OCT. ARTS CRAFT + WW1 COMMEMORATIVE SERVICE. SAT 27TH OCT. POPPY LAUNCH. SUN 28TH OCT GHELUVELT SERVICE. WEDS 31ST OCT. GHELUVELT DAY, SHORT SERVICE AT STONE. SUN 11TH NOV. REMEMBRANCE SUNDAY - BEACON OF LIGHT. THURS 15 NOV. OMBERSLEY CHURCH SERVICE. FOR SCHOOLS. PAGE 5, DATES FOR MEETINGS / EVENTS. 20TH & 21ST OCTOBER 2018 ST PETERS GARDEN CENTRE ARTS & CRAFTS & WREATH LAYING CEREMONY IN RESPECT OF END WW1. PTE 23791698 PETER JOHN(JACK) PICKARD. LCPL 4979024 WILLIAM FRANK MELLOR. PAGE 12 OBITUARIES. 22310908 (Rank Unknown) Raymond Percival Quin FUNERAL YESTERDAY 13TH SEPT. PAGES 7 & 12, NEWSLETTER 1 & OBITUARIES. LCPL HAROLD WILLIAM WOOD. MR TONY MILLWARD BEM. PAGES 7 & 12, NEWSLETTERS & OBITUARIES 24TH AUGUST 23685158 Cpl John 'Blackie' BLACKSHAW. 31st August 24225401 LCpl Ronald ( 'Joe 90' ) Arthur Norfolk. Funeral Details amendment 25064939 LCpl Jonathan ‘Jonny’ COLE . PAGES 7 & 12 NEWSLETTER 1 & OBITUARIES. 25064939 LCpl Jonathan ‘Jonny’ COLE . FUNERAL DETAILS 24203909 Pte Stuart HALL. PAGE 9. COMBAT STRESS HELPLINE ADDED TO THIS PAGE. PAGES 7 & 12 NEWSLETTER 1 & OBITUARIES. FUNERAL DETAILS FOR Mrs Lois Batchelar, widow of Lt Col T A Batchelar. Page 5, DATES FOR MEETINGS EVENTS. Wednesday 15th August 2018.10:45hrs VJ Day, Burma Star, The Almonry Heritage Centre Abbey Gate Evesham Worcestershire. WR11 4BQ . PAGE 7 & 12, NEWSLETTER 1 & OBITUARIES. Mrs Lois Batchelar, widow of Lt Col T A Batchelar. PAGE 5, DATES FOR MEETINGS/EVENTS/ PARADES . DATES FOR DIARIES AND DETAILS OF COACH TRIPS TO NATIONAL MEMORIAL ARBORETUM & ARMY MUSEUM LONDON. PAGE 7 & 12, NEWSLETTERS 1 & OBITUARIES. 22847593 CSGT G THOMAS JONES. 4975485 SGT WILLIAM HENRY (HARRY) JACKSON. PAGE 5, DATES FOR MEETINGS EVENTS PARADES. CHANGE OF DATE NMA 23RD SEPTEMBER NOT 30TH. PAGES 7 & 12, NEWSLETTERS 1 & OBITUARIES. 23720274 Sergeant Clifford TAYLOR. PAGE 15, GUESTBOOK. POST DATED 1ST JUNE 2018, RE INFO ON FORESTERS P.O.W`s. PAGE 5, DATES FOR EVENTS/MEETINGS/PARADES. 21st May Friday 12:00hrs 2018. Friar St Worcester Plaque unveiling to Hannah Snell the Female Soldier, click on link on page. 15TH SEPT 2018 DRUMHEAD SERVICE GHELUVELT PARK. 30TH SEPTEMBER SERVICE, MARCH PAST NMA AT MERCIAN VOLUNTEERS GROVE. PAGE 6, NEWS ANNOUNCEMENTS. HAWKING FOR HEROES. FREE EXPERIENCE FOR INJURED VETERANS. PAGES 7 & 12, NEWSLETTER 1 & OBITUARIES. 27800796 SGT TERENCE HENRY MARKHAM. FUNERAL DETAILS FOR 23447861 PTE MALCOLM BERNARD JUDD. PAGE 5. DATES FOR EVENTS/MEETINGS/PARADES. DETAILS FOR REUNION. PAGE 15, GUESTBOOK. POST FROM, S MUSSETT RE 3 WFR. POSTED 2ND MAY 2018. PAGES 7 & 12, NEWSLETTER 1 & OBITUARIES. CPL WALTER JOHN YATES. 23447861 PTE MALCOLM BERNARD JUDD. PAGE 16, LOST FRIENDS. CONTACT DETAILS FOR JOE LAWS LCPL PROVOST FROM GERALD 'NOBBY' CLARKE. PAGES 7 & 12, NEWSLETTER 1 & OBITUARIES 24022457 PTE KENNETH C ROSE. FUNERAL DETAILS FOR 14189210 PTE HAROLD JAMES MANNING. PAGE 5, DATES FOR MEETINGS/EVENTS/PARADES. MORE DATES FOR DIARIES. PAGE 5, DATES FOR MEETINGS/EVENTS/PARADES. MAYORS CIVIC LECTURE BY COL. MARK JACKSON. PAGES 7 & 12, NEWSLETTER 1 & OBITUARIES. 14189210 Pte Harold James MANNING. PAGE 2 GREETINGS ON BADAJOZ DAY. PAGE 5, DATES FOR PARADES EVENTS MEETINGS. SATURDAY 14TH APRIL WREATH LAYING CEREMONY, 2ND LT J.J. CROWE V.C. CITATION ON PAGE. PLEASE READ. NOVEMBER MEETING ,NEW DATE 11TH DECEMBER 2018. PAGE 15, GUESTBOOK. POST FROM RICHARD BOND RE- WHITTINGTON BARRACKS. PAGE 12, OBITUARIES. Brig H A Woolnough CBE - Funeral 12 April 2018. PAGES 7 & 12, NEWSLETTER 1 & OBITUARIES. 461526 Brigadier Herbert Arthur (Bertie) WOOLNOUGH CBE. PAGES 7 & 12, NEWSLETTERS 1 & OBITUARIES. 22220605 LCPL ALBERT DENNIS RIMINGTON. MRS NATALIE BARKER. PAGES 7 & 12, NEWSLETTERS 1 & OBITUARIES. 387660 (RETD) JOHN CURZON CURSHAM TD. 22953775 WO1 JJ GREGORY. 23977686 PTE EZRA GASCOYNE.